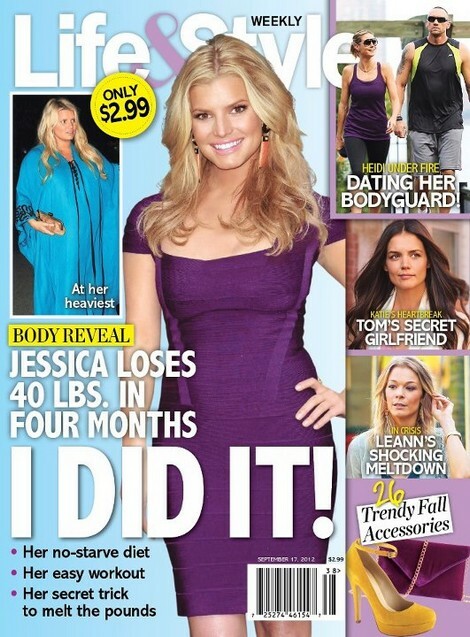 The current issue of Life & Style Magazine features the cover story “Jessica Loses 40 lbs in Four Months – I Did It!” Did you know that Jessica Simpson has lost 40 pounds in the four months since giving birth to her daughter? Me neither but that’s exactly why we both need to grab the new issue of Life & Style Magazine because it features Jessica’s the inside track on just how Jess managed to drop a chunk of her baby weight while no one seemed to realize it! Check out the big reveal- her new figure- and then learn what diet and gym routine has really worked the best for her. Also inside is an in-depth peek at LeAnn Rimes’ complete mental meltdown. The singer claims that a case of cyber-bullying via Twitter is what caused her to not be able to deal with life however those close to her say the problems lie within LeAnn’s home. She believes her husband, Eddie Cibrian is having an affair and that’s why she lost her marbles. Any way you look at it, LeAnn has lost here. She’s all but given up her career to cling to her husband’s side and in the end, all the bikinis’ in the world can’t keep him loyal if he likes the excitement of other women. Life & Style also has some info on Tom Cruises’ secret girlfriend and the affect that his moving on so quickly has had on Katie Holmes. A new story developing focuses on Heidi Klum and her bodyguard. The two have apparently been getting hot and heavy and her ex, Seal is none too happy. He can frolic with multiple women while the former couples’ kids sleep in the next room, but Heidi can’t hook up with the man who protects the kids. Or so says Seal. Pick up the latest issue to of Life & Style to find out all these stories and more in this week’s issue! It’s on newsstands now!